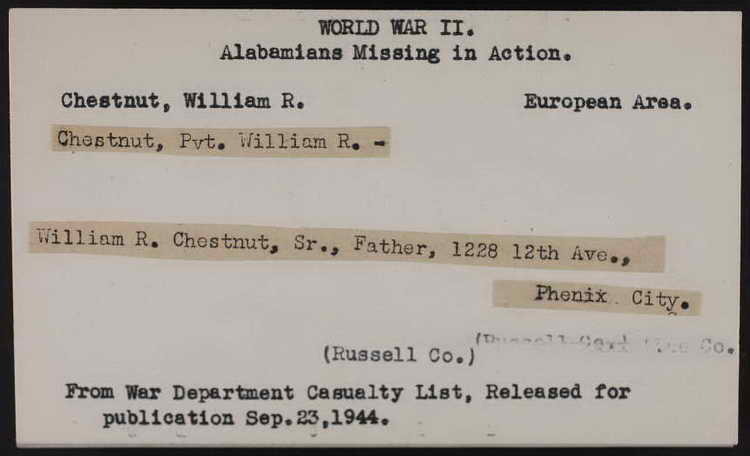 The Co. F Morning Report for 16 July 1944 listed Pvt Chestnut as "missing in action as of 6 June 44". 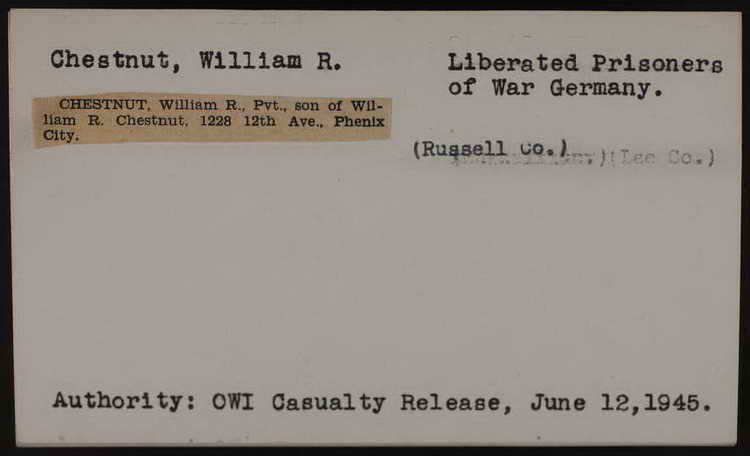 In reality, William was not missing, he had been taken prisoner on D-Day. "If you've never seen a German blow his top, let me tell you he can really do it." Rudolph Chestnut, 22-year-old Phenix City paratrooper who is now home on an 81-day recuperation furlough after spending 10 months in a German work camp, told Phenix city Lions Tuesday night. For no apparent reason, Nazi guards would stride furiously among prisoners forced to work in an antiquated cotton mill in Pobershaw, located in central Germany, and rant at length, he said. "There were three distinct classes in the mill --- the slaves, the guards and the 'big shots'. Each had his firmly established position and could neither go up or down. "I've found that to be true with most Germans --- the ones I've come in contact with, at least," he noted. 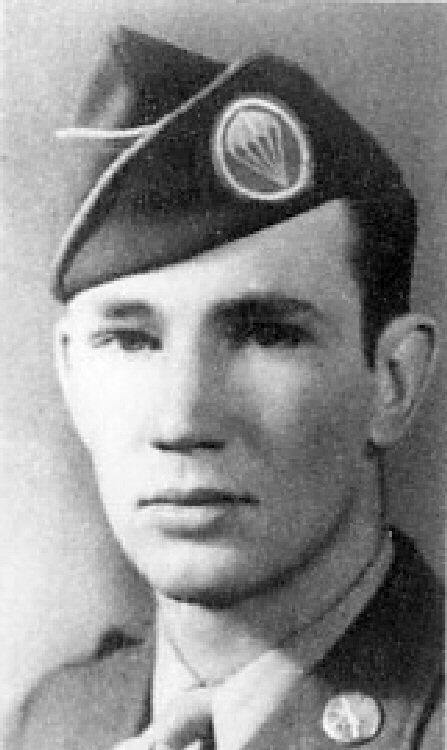 Captured when jumping over Normandy on D-Day, "Rudy" was the first Phenix City boy to be interned in a German prison camp and is the first Phenix City prisoner to return home. "In spite of everything, we didn't consider our work so bad," he reminisced, "because it was a heck of a lot better to keep our minds occupied than to do nothing, as many men in other camps were forced to do." "Everyone was reasonably contented until one day we opened a bale of cotton and discovered a Selma, Ala. label. Knowing that the cotton we worked with came from America made us happy --- it was so good to see anything American. "Another day we found an empty Luck Strike package in one of the bales. We tacked it to the bulletin board of our billet, fell in line and gazed at it, one by one each day, until someone stole it." Their outstanding sources of cheer and encouragement, the young paratrooper recounted, were Red Cross food parcels, which were devoured visually before being devoured actually, and the American Air Corps flying overhead. During the latter part of July when American forces were bombing towns only three kilometers from though camps, every prisoner packed his only belongings and waited jubilantly for liberation. "One day every German left the camp early in the morning and we knew something was up. Later we saw a little puff of smoke coming down the road and as it grew nearer we saw it was a lone Russian soldier riding a motorcycle. "He paused long enough to tell is that his unit would soon release us, and away in another cloud of smoke he went." Sgt Chestnut's description of liberating Russian forces completely delighted the Lions. "No two uniforms were alike, they were dirty and unshaven and they rode in a varied assortment of transportation --- American jeeps, Russian trucks, saddle horses and even wooden buggies --- but they really looked beautiful to us,' he concluded. Upon completion of his furlough, Rudy will be assigned to Miami's rest camp for two weeks before being reassigned to Fort Benning, he revealed. A graduate of Central High School, he was introduced by Lion W. O. Langley, principal of the school, as "one of my boys."